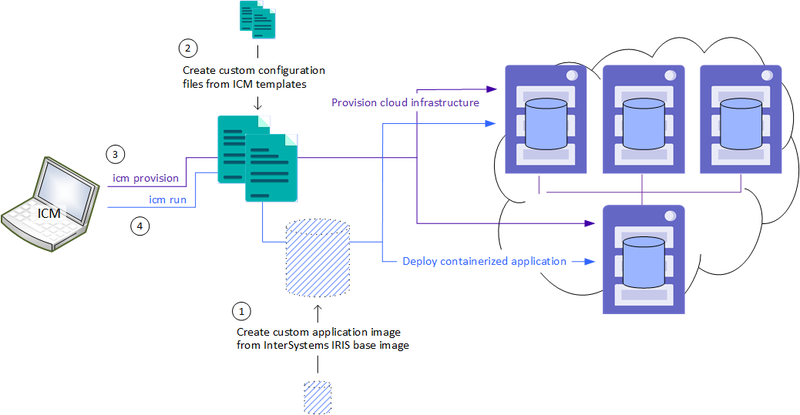 This chapter explains what InterSystems Cloud Manager (ICM) does, how it works, and how it can help you deploy InterSystems IRIS Data Platform configurations on cloud, virtual, and physical infrastructure. For a brief introduction to ICM including a hands-on exploration, see First Look: InterSystems Cloud Manager. InterSystems Cloud Manager (ICM) provides you with a simple, intuitive way to provision cloud infrastructure and deploy services on it. ICM is designed to bring you the benefits of infrastructure as code (IaC), immutable infrastructure, and containerized deployment of your InterSystems IRIS™-based applications, without requiring you to make major investments in new technology and the attendant training and trial-and-error configuration and management. ICM makes it easy to provision and deploy the desired InterSystems IRIS configuration on Infrastructure as a Service (IaaS) public cloud platforms, including Google, Amazon, and Azure. Define what you want in plain text configuration files and use the simple command line interface to direct ICM; ICM does the rest, including provisioning your cloud infrastructure with the widely-used Terraform IaC tool and deploying your InterSystems IRIS-based applications on that infrastructure in Docker containers. ICM codifies APIs into declarative configuration files that can be shared among team members like code, edited, reviewed, and versioned. By executing Terraform commands as specified by these files, ICM enables you to safely and predictably create, change, and improve production infrastructure on an ongoing basis. Using ICM lets you take advantage of the efficiency, agility, and repeatability provided by virtual and cloud computing and containerized software without major development or retooling. The InterSystems IRIS configurations ICM can provision and deploy range from a stand-alone instance, through load-balanced application servers connected to a data server in a distributed cache cluster, to a basic or complex sharded cluster. ICM can also deploy InterSystems IRIS on existing virtual and physical clusters. Even if you are already using cloud infrastructure, containers, or both, ICM dramatically reduces the time and effort required to provision and deploy your application by automating numerous manual steps based on the information you provide. And the functionality of ICM is easily extended through the use of third-party tools and in-house scripting, increasing automation and further reducing effort. Configuration file templates allow you to accept default values provided by InterSystems for most settings, customizing only those required to meet your specific needs. The command line interface allows you to initiate each phase of the provisioning and deployment process with a single simple command, and to interact with deployed containers in a wide variety of ways. IaC brings the ability to quickly provision consistent, repeatable platforms that are easily reproduced, managed, and disposed of. IaaS providers enable you to utilize infrastructure in the most efficient manner  for example, if you need a cloud configuration for only a few hours, you pay for only a few hours  while also supporting repeatability, and providing all the resources you need to go with your compute nodes, such as networking and security, load balancers, and storage volumes. 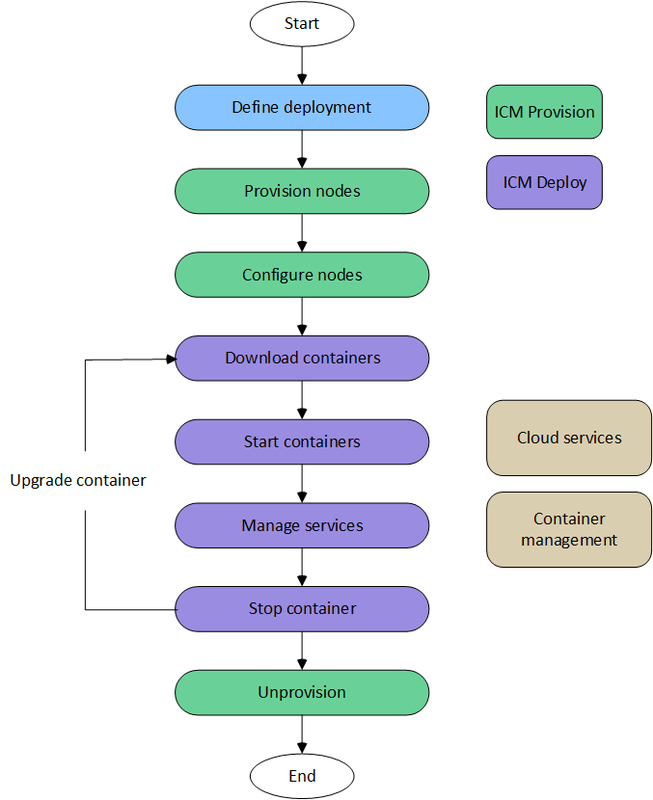 Containerized application deployment means seamlessly replaceable application environments on immutable software-provisioned infrastructure, separating code from data and avoiding the risks and costs of updating the infrastructure itself while supporting Continuous Integration/Continuous Deployment (CI/CD) and a DevOps approach. You can work with InterSystems IRIS container images provided by InterSystems to deploy InterSystems IRIS, or as the base for your own application images. Automated provisioning and deployment, and command-line management, of large-scale, cloud-based InterSystems IRIS configurations. Integration of existing InterSystems IRIS and InterSystems IRIS-based applications into your enterprise’s DevOps toolchain. Increased agility through fast reprovisioning and redeployment when required. Stability, robustness, and minimization of risk through easy versioning of both the application and the environment it runs in. For a brief introduction to the use of InterSystems IRIS in Docker containers, including a hands-on experience, see First Look: InterSystems IRIS in Docker Containers; for detailed information about this topic, see Running InterSystems IRIS in Containers. In this document, the term compute node is used to refer to a virtual host provisioned either in the public cloud of one of the supported cloud service providers or in a private cloud using VMware vSphere. ICM supports three main provisioning activities: the creation (provisioning), configuration, and destruction (unprovisioning) of compute nodes and associated resources in a cloud environment. ICM also carries out some postprovisioning configuration tasks using SSH in the same fashion, running commands in parallel on multiple nodes for faster execution. ICM deploys prebuilt InterSystems IRIS images in Docker containers on the compute nodes it provisions. These containers are platform-independent and fully portable, do not need to be installed, and are easily tunable. ICM itself is deployed in a Docker container. A containerized application runs natively on the kernel of the host system, while the container provides it with only the elements needed to run it and make it accessible to the required connections, services, and interfaces  a runtime environment, the code, libraries, environment variables, and configuration files. ICM runs Docker commands across all machines in parallel threads, reducing the total amount of time to carry out lengthy tasks, such as pulling (downloading) images. ICM can orchestrate tasks, such as rolling upgrades, that have application-specific requirements. For detailed information about running InterSystems IRIS and InterSystems IRIS-based applications in Docker containers, see Running InterSystems IRIS in Containers. ICM commands let you interact with and manage your infrastructure and containers in a number of ways. For example, you can run commands on the cloud hosts or within the containers, copy files to the hosts or the containers, upgrade containers, and interact directly with InterSystems IRIS. For complete information about ICM service deployment and management, see Deploy and Manage Services.